We only have one planet to live on and right now; it’s sick and needs our help! The goal of the Carrollwood Green Team is to teach our students, staff, and parents how to take better care of the planet. 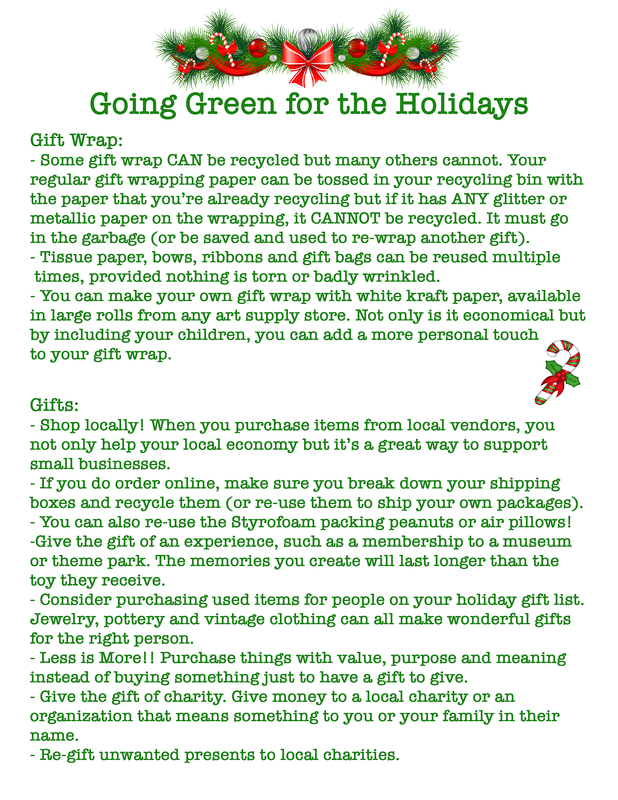 Each month we will give you a Going Green Tip, which will be something you can do to help make the planet healthier. 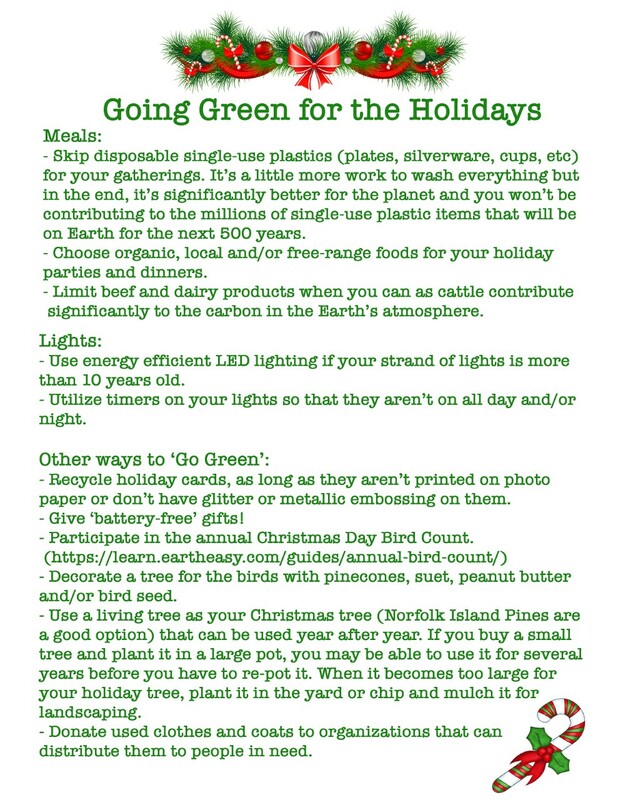 For the rest of the that month, we will practice the tools we learn from the Going Green Tip at school to help fix that problem. If you want to practice at home too, that’s even better! In addition to the Going Green Tip, each month we will also have a pledge for your child to take that focuses on practicing what they’ve learned that month. To participate, you and your student can go online to sign the pledge. Part of taking the pledge means talking to your family about what your student learned, and working together to practice the solutions. Students that participate for at least 6 months (6 pledges signed online) will earn a special reward at the end of the year. If you miss a month, that’s okay! You can work on two pledges at the same time if you want to catch up! For almost 50 years, Earth Day has been celebrated as a day to bring people together to find ways to better protect the planet. The first Earth Day occurred on April 22, 1970, and was founded by Gaylord Nelson, a senator from Wisconsin. Nearly 20 million Americans attended rallies and protests on that day in an attempt to bring global awareness to the environmental issues facing the planet. Air and water pollution, loss of biodiversity (both plant and animal species), habitat loss and deforestation and pesticide over-use were all major issues on that day. While we are still finding ways to deal with these issues today (as well as a few additional ones, like climate change and our dependence on single-use plastics), it is believed that more than 1 billion people in 192 countries participate in Earth Day activities globally every year. Every year, the Earth Day Network focuses on a new theme. This year’s theme is Protecting Our Species. https://www.earthday.org/campaigns/endangered-species/earthday2019/ While it may not seem like it, there are TONS of things we can do to help protect wild animals, even the ones that don’t live in Florida! If you remember from January and February’s pledges, plastics can be very dangerous for wild animals. If they eat plastic, it can make them sick or can even kill them. Picking up trash (as long as it is safe for you to do it and you can wash your hands immediately after) is a great way to help protect animals!! 3. Clean up fishing line! If you’ve ever been fishing with mom or dad, you know how easy it is to lose fishing line when your line breaks. However, that line could get wrapped around a turtle’s flipper, a pelican’s wing or a dolphin’s tail. It is super important that you find your broken line and retrieve as much of it as possible. You can also protect animals by finding fishing line discarded by other fishermen and throwing it away. Most fishing piers have a special PVC tube for collecting used fishing line or you can just take it home and throw it away. 5. If you’ve been following along each month and participating in the monthly pledges, you are well on your way to being an amazing steward of our beautiful planet and fulfilling the mission of Earth Day. If you haven’t started yet, there’s still time!! You can work on more than one challenge per month. But next month is your LAST chance to participate in the pledges for this school year so if you haven’t started yet, get to work. Earth Day isn’t just one day a year….it should be something we celebrate every day, as part of our mission to be good protectors of the Earth. As always, pick one thing to start with. When that feels comfortable, pick something new to try. Doing small things every day will make a big impact over time! Go Green!! 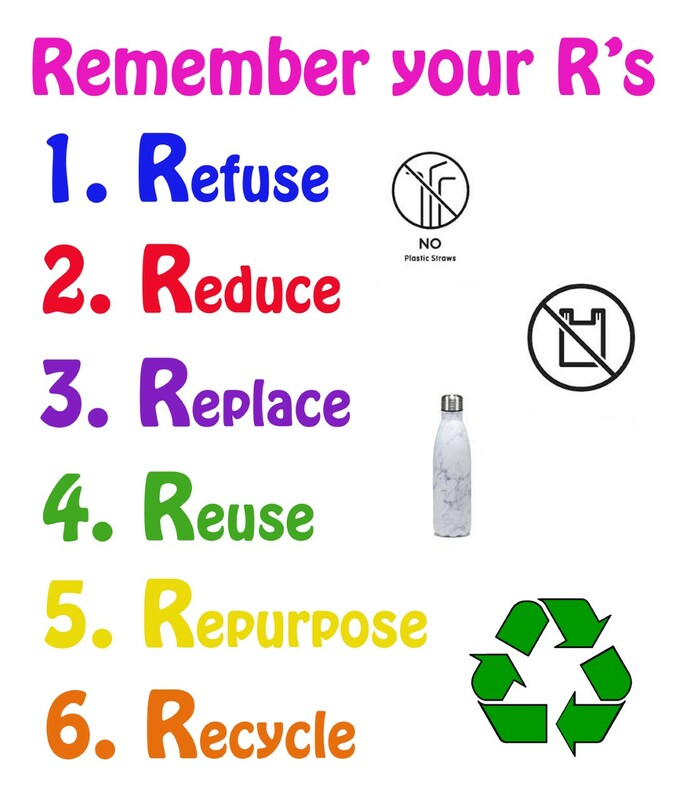 In October, we began our journey toward living a “greener” life by learning about the 6 R’s (refuse, reduce, replace, reuse, repurpose, recycle). We learned about ways to decrease our water usage (November) and how to reduce or eliminate our dependence on single-use plastics (January and February). If you’ve been participating in the pledges each month, you are already well on your way to living a “greener” life and helping to take care of the planet!! 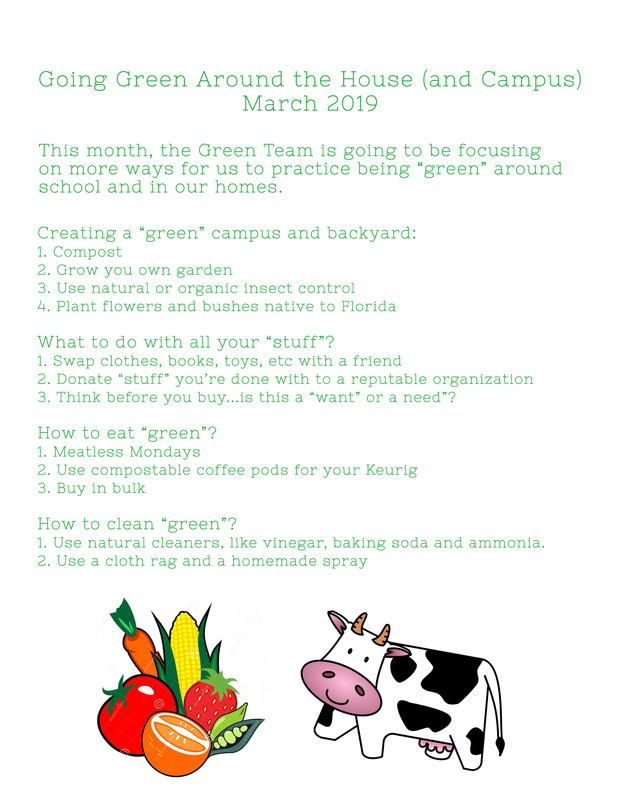 This month, the Green Team is going to be focusing on more ways for us to practice being “green” around school and at our homes. 3. Plant native plants – native plants are plants that are naturally found in a given area and are great for lots of reasons! Because Florida’s native plants are used to our climate and rainfall, they tend to not need as much attention as plants that are native to other regions (but planted in Florida). You don’t need to remember to water them during the dry season and they don’t need to come into your house when it starts to get cold (those 3-4 days we get each year). just a few of the yummy things growing right here on campus!! You can grow one at home too!! What do I do with all this stuff?? The planet is overwhelmed with stuff!! Clothing, toys, books….when you look around your home, it can be alarming to realize how much “stuff” we accumulate in our lives (and how little of it we actually use). Many of these items end up being reused again by someone else but a lot of our “stuff” just ends up in a landfill, where it may take years or even decades to break down. So what can you do?? 1. Swap with a friend — if you’re tired of your clothes (or toys or books), do a swap with a friend! Not only does it give you something new to wear or do, it’s free AND it doesn’t add more “stuff” to your home. 3. Think before you buy…is this a want or a need? When we see something we want to purchase, we often talk ourselves into buying it by saying we “need” to have it. But when you think about it, many of the things we “need” are actually “wants”. So before you purchase another Lego set or stuffed animal or pair of sandals, ask yourself if it is a “want” or a “need” and whether you will just be adding to a landfill a year from now if you purchase this item. 1. Meatless Mondays – Scientific data tells us that carbon is a major contributor to increasing global temperatures and one of the biggest contributors to carbon is cows!! Because of their diet, cows produce methane (CH4) as part of the digestive process (up to 55 gallons/day). And because we have 1.5 billion cows on the planet, that adds up to a lot of methane! One of the easiest ways to combat this is by limiting our consumption of beef and dairy products. Just one day a week will make a huge impact over time!! are easy to find, especially online, and come in many of the flavors and types of coffee that the non-compostable plastic options do. 3. Buy in bulk – Single-serving packages are great for convenience as well as making better choices regarding serving sizes but the smaller packaging comes with a price…it creates more packaging waste that is often not recyclable. A better option for a ‘greener’ lunch includes buying a larger bag/container of the item in question and packing it in a smaller container to take for lunch. 2. Use a cloth rag (that can be washed and reused) and homemade spray (made with bleach and water) instead of disinfecting wipes (which don’t break down easily over time). Teachers, this one will save you $$$ when you think about how often you have to wipe down desks and tables in your classroom! 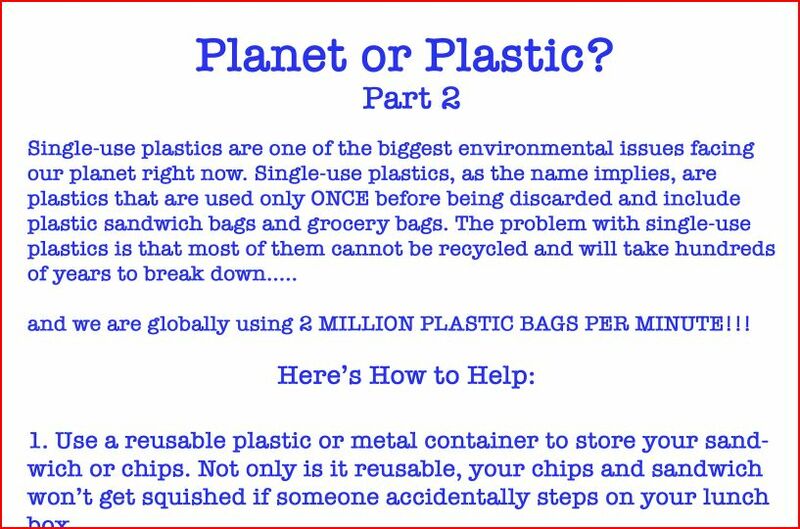 Welcome to Part 2 of ‘Planet or Plastic?’ Last month, we learned why single-use plastics (plastics that are used only once before being discarded) are so destructive to the planet. One of the biggest problems with single-use plastics is that most of them cannot be recycled and will take hundreds of years to break down. Of the ones that can be recycled, fewer than 10% actually are. That’s why it is so important that we find alternatives to single-use plastics whenever we can, like reusable water bottles, straws and utensils (and if you want to learn more about them, read last month’s Going Green Tip). 1. More than 5 trillion pieces of plastic are already floating in our oceans. 2. 73% of the litter found on beaches worldwide is plastic (bottles and bottle caps, food wrappers, grocery bags, styrofoam containers)….where do you think all of this plastic ends up?? See #1 above…. 3. Plastic production globally has increased exponentially from 2.3 million tons in 1950 to 162 million tons in 1993 to 448 million tons in 2015 (remember how much of this gets recycled?). 4. As of 2015, almost 7 billion tons of plastic waste had been generated. 21% of that plastic was either recycled or incinerated….the rest is filling up our landfills or oceans. 5. Globally, almost 1 million plastic bottles are sold EVERY MINUTE!! 6. Plastics have affected roughly 700 species of marine animals, either through ingestion (eating) or becoming tangled in it. This month, we are going to be focusing on other types of single-use plastics and how you can reduce or even eliminate your dependence on them. Plastic Bags are one of the biggest single-use plastic problems! They aren’t biodegradable (meaning they won’t break down over time into natural materials) or recyclable (in many cases). When they end up in the ocean, which they do (A LOT), they become food for unsuspecting animals that don’t recognize that the plastic bag isn’t a jellyfish. The plastic bag (and other plastic debris that may have been eaten) just sits in the animal’s stomach until it gets sick and needs our help to make it better. A sperm whale in Indonesia was found to have two flip-flops, 115 drinking cups, 25 plastic bags, and four plastic bottles in its stomach!! Many of us use plastic sandwich bags every day and yet we don’t usually spend much time thinking about what happens to the bag that held our sandwich once we’ve thrown in into the garbage. Guess what?? Nothing happens to it! It doesn’t get recycled (because it can’t). It doesn’t break down, or biodegrade, because it can’t. It spends the next several hundred years in a landfill (if we’re lucky) or in the ocean (if we’re not), waiting to slowly fall apart. And it is estimated that the average person uses 540 plastic sandwich bags per year. That’s a lot of bags!! 1. Use a plastic reusable container to store your sandwich or chips. Not only is it reusable, but your chips and sandwich won’t get squished if someone accidentally steps on your lunch box!! 2. Use reusable cloth sandwich bags! They’re washable (and cheaper than having to purchase plastic baggies for your lunch every week) AND you can find them online and locally (at places like Target or Walmart). 3. If you have to use a plastic baggie, wash it (if possible) and reuse it for something else. Those aren’t the only kind of plastic bags causing problems on our planet today, though. Plastic grocery bags are another huge issue and globally, we use 2 million plastic bags every minute!! Again, there are some very easy ways to solve this problem! 1. Bring reusable grocery bags when you go shopping (you may have to remind mom and dad in the beginning until they remember on their own!). They’re inexpensive and can be used for years and years!! 2. If you forget your bags and have to get plastic ones at the store (we’ve all been there), reuse them for something else OR return them to the store and RECYCLE them!! If they have the green recycle symbol with a ‘2’ in the middle, they can often be recycled at the store (just don’t put them in your bin at home!!). Publix has large green bins outside their stores for plastic grocery bag recycling. 3. Say ‘No Thanks’ to the plastic bag at the department store if you can carry your purchases out easily without losing anything (or bring your own resuable shopping bag….you can buy these almost anywhere). Most stores are grateful since you’re saving them money too! As always, start small by replacing one thing at a time and just keep adding to it. Before long, you’ll find that you don’t need plastic bags nearly as much as you thought you did, and the planet will be a lot healthier because of you!! Go Green!! Single-use plastics are one of the biggest environmental issues facing our planet right now. Single-use plastics, as the name implies, are plastics that are used only once before being discarded and include bottles, straws, takeout containers, utensils, bags and styrofoam (and accounts for roughly 40% of our plastics usage). The problem with single-use plastics is that most of them cannot be recycled and will take hundreds of years to break down. Of the ones that can be recycled, fewer than 10% actually are. For the next two months, the Green Team is going to focus on ways you can reduce (or even eliminate) the single-use plastics in your life. This month, we are going to talk about alternatives to plastic bottles, straws, utensils and styrofoam and why we need them. 1. While it is unknown how many plastic straws are used globally every day, the statistic is undoubtedly higher than it should be, especially when there are so many great alternatives!! Not only are plastic straws not recyclable or biodegradable (meaning they don’t break down), they are also a threat to animals when they are swallowed. When you go out to eat, skip the straw!! Tell your server ‘No, thank you’ when they bring straws to your table (and tell your server why you are skipping the straw). Or if you order through the drive-through, tell them ‘no straw please” when you order your food (and check your bag before you leave, ‘cause they always seem to sneak them in there anyway). Purchase a straw that you can bring with you! Alternatives to plastic straws include stainless steel, glass and paper and come in a variety of sizes, shapes and colors. In addition, there are some that are portable enough to be carried on your keychain so you always have one with you!! Search online (Amazon has some great ones) or at one of your local retailers for your options. 2. As mentioned above, we as a planet purchase nearly 1 million plastic bottles EVERY MINUTE (and only 10% of those bottles are recycled). While not all of these plastic bottles contain water, a significant number of them do and America’s obsession with bottled water has continued to increase every year. There are, of course, instances when bottled water is the safest option but for the rest of us, using a reusable aluminum or glass water bottle is a perfect alternative to a plastic single-use water bottle. Not only is bottled water more expensive than water from the tap, it can be catastrophic to the environment. Bottle production includes crude oil byproducts and takes 1.39 liters of water just to make the 1 liter bottle (hmmm….something seems off here). If you participated in November’s Going Green Challenge, you know how precious water is and how important it is that we conserve it whenever possible, so using more water to create the bottle than the water inside it doesn’t seem like a good “water conserving” choice, does it? Purchase a reusable stainless steel or glass water bottle that you can use over and over!! Yes, it takes a little more energy to fill your water bottle before you leave the house (versus grabbling a plastic bottle from the fridge) but when you consider the environmental consequences of your plastic bottle, it’s an easy choice to make. 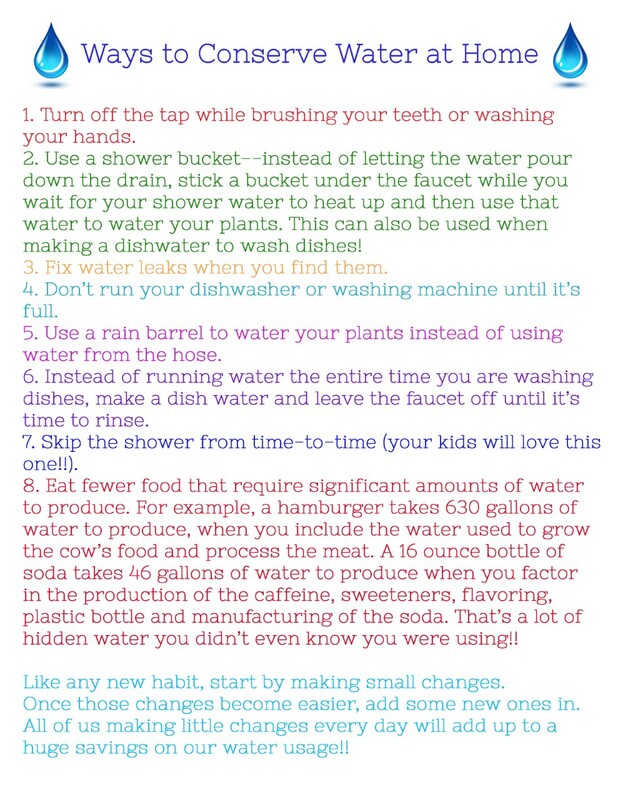 If you don’t like the way tap water tastes, there are filters and purifiers to help with that too! Bring your own reusable water bottle to school every day! The Green Team estimated that Carrollwood Elementary uses _______ plastic cups for water in the cafeteria every month. Just imagine how much we could help the planet if we just bought our own water bottles to lunch. 3. While not quite as common as bottles and straws, plastic silverware and styrofoam containers are also single-use plastics that are contributing to the environmental plastic disaster. We use them for picnics and parties and when we order take-out from a restaurant. We use them in the lunchroom at school or work. And like all of the other single-use plastics mentioned above, they will be on this planet for several hundred years. They can’t be recycled and they don’t biodegrade, or break down, easily. Use actual silverware for your picnic or party (instead of plastic stuff). If you don’t want to use your nice utensils from home, purchase an inexpensive set that you use for “to-go” moments. Or just wash your plastic silverware after your picnic/party and reuse it. Another way to help is to create your own travel kit of reusable utensils. Toss a fork, spoon and stainless steel straw in a pouch and put it in your backpack, purse or briefcase. After using it, wash it and return it to your bag. While avoiding styrofoam containers from restaurant take-out is tricky, you can bring your own plastic containers for your leftovers and have your server put your food in those instead of the styrofoam they typically use! Once you start to pay attention to how much single-use plastic you are using on a daily basis, you may find yourself surprised at how dependent you and your family have become on it. But don’t worry!!!! 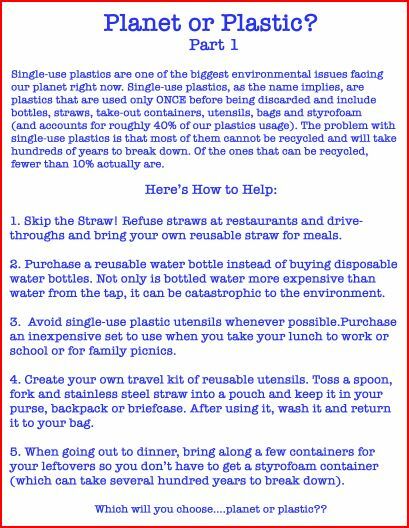 You will just as easily find that there are countless ways to avoid single-use plastics that are easy to do. To get started, choose one single-use plastic item (straw, bottle, utensils, styrofoam) that you would like to replace and start there. Continue adding ways to make your life “plastic-free” every week! It’s time to choose….Planet or Plastic?? October’s Challenge is the practice the 6 R’s! Starting new habits can be tough, but we’ve got your back. Click below to download a printable poster that you can print out and hang on your fridge to help you remember!